Trust me, if there is one thing you want to do when visiting the Louvre, it is get your Louvre ticket before going to the museum; otherwise, your wait will be hours! What is crazy is the amazingly long lines you see for those without tickets is just the line to get through the security. Those with tickets actually go through another line but feed into the same security checkpoints but get to merge in before those without tickets. Then, you have to go stand in another queue to actually purchase your tickets. You can waste hours before you have even seen a piece of artwork. Don’t do that! One popular way of getting your ticket beforehand is by buying a The Paris Pass which is a package of entry tickets to various museums and sites, as well as, many other additional activities like hop on/hop off tour bus, metro travel and a Seine River cruise. One of the main advantages of The Paris Pass is the “fast track” entry queues. But what if you decide The Paris Pass isn’t for you, then what? There is always buying your ticket online. If you plan ahead and pay a bit more, you can have your ticket sent to you (US and Canada only) or can buy online and then pick it up at designated ticket offices. But, what if you are like me and you don’t want to pay more and you want an easy way to get your tickets without having to figure out the online options? Well, I’m about to reveal a little secret thanks to the inside scoop courtesy of Daisy from THATLou. I think this is the best way to buy your Louvre Museum entry ticket. Located within Carrousel du Louvre (an underground shopping arcade conveniently attached to the Louvre Museum) is a little Tabac that sells them. Secret revealed! Finding this Tabac (a store that sells tobacco products as well as other sundries) is really easy. There are a couple of ways to find it. ~Across the street from the metro entrance, you’ll see the museum and a red awning which is 99 Carrousel du Louvre. Go through those doors. This is one of the entrances to the Carrousel du Louvre. ~Then you will go down 3 escalators. ~ Once you hit the ground floor, turn right on Allee de France. The corridors are named like streets. Convenient, huh? ~Then walk to the end and you’ll see the Tabac to your right. Buy your ticket and then breeze by everyone without one. ~ If you have your back to the Arc de Triomphe du Carrousel and facing the Louvre Museum, there are two entrances that go down to the Carrousel du Louvre. They both meet up at the same place (a row of statues) so it doesn’t matter which one you take. ~Ahead of you, you will see the inverted pyramid. Don’t go to it but instead, if facing it, take an immediate left. ~Walk straight ahead. There will be remnants of the original fortress stone walls along the side. You’ll also see McDonald’s on the second floor directly above the tabac. At the time of this post, the cost is the same as if you bought the ticket at the museum. This tabac also sells tickets to other museums – the D’Orsay, the L’Orangerie, the Picasso as well as to Chateau Versailles (accurate at the time of posting). So, on the day you want to visit the Louvre, swing by the tabac first, purchase your ticket then head up to the main entrance line that says “avec billet” which means “with tickets.” You’ll breeze by all those who weren’t in on the secret. 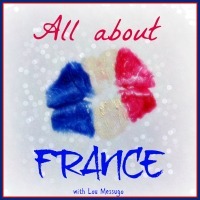 This post is part of #AllAboutFrance hosted by Phoebe from Lou Messugo. We are under 26 years and the Louvre should be free for us. How does that work with the secret passages? If you are a resident of the EU, Iceland, Norway, and Liechtenstein, you can enter through the “avec billet” line at IM PEI pyramid and simply show your ID to confirm age and residency. Those under 18 are free regardless of country. 18-26 is only free if from the countries listed. If you are 18-26 and not a resident of the countries listed, you will need to purchase a ticket. I can confirm that this still works as of April 2017! We just purchased our tickets and visited the Louvre yesterday, worked perfectly. Tickets are still the same price from the tabac as from the museum itself. Great! I’m glad it was helpful for you. You are welcome. I am glad it was helpful. Thank you so much for that info! I thought I was losing my mind not being able to find USA or America!! Does anyone know if a child under 18 who gets in free need a physical ticket? If I have my adult ticket, can they just come in with me without a ticket or do we need to stand in line and get a free admission slip? Your child can just enter with you. No special ticket needed. Great tip! I am curious if once you purchase your ticket from the tabac if you can enter with the pre-purchased ticket through the undergound entrances (Carousel de Louvre entrances) or only through the main entrance by the Pyramide? I have read that lines are still much longer at the outside entrance than underground and I am hoping to avoid those. Usually for the general public with tickets, you have to enter through the Pyramid. You can also try the Porte des Lions entrance. That entrance is only open at certain times and on certain days. What I would recommend is to purchase your ticket at the tabac, go up the stairs to the outside. Check out the line at the Pyramid. If it is longer than you’d like, walk over to your right (if facing the Louvre) and check out the Porte des Lions entrance. It really won’t be too much out of your way if it is closed. In general (and I say that because things can change, entrances can be closed and you could just time it right…or wrong), the line at the Pyramid for those with tickets is shorter. Then went upstairs to the main entrance and waited in line for an hour to get through security. The line for people with tickets and those without was pretty much the same. I may have just been unlucky with my timing, but at least once I was through security I walked straight through with ticket in hand, and didn’t have to stand in another line. You are welcome. Usually, the line for those with tickets is shorter but at least you didn’t have to spend time waiting in a second line! As tourist season starts ramping up, all lines in Paris will be long. Thanks for this great tip! We saved quite a bit of time today. Note that the store only accepts cash for the tickets. Not sure if this was because their credit card machine was broken today. Was a busy day and we saw long lines outside the main entrance from the cafe inside and felt we saved a lot of time! Thank you! I am so glad it worked for you! Yes, I think they are cash only. Good reminder. Thank you so much for this great insider tip. My husband and I followed your directions and had a wonderful day at the Louvre today. There was no line for tickets at the tabac, and only a very brief wait at the security check. So glad we didn’t have to join the crowds upstairs! *BONUS* The tickets at the tabac were 2EU cheaper than the online price. Great! I’m glad it helped. Came across your site and a lovely way to buy the tickets! I see that buying online has a timing to it, and since the last comment was in January, I am not sure if the tickets at tabac are still neither date nor time specific? Cheers! Buying at the tabac is neither date not time specific. That is what makes it so great! So I’m a bit of a planner. If I buy tickets online in advance for our May visit, can I use those tickets to access the museum through the underground entrance? Or must they be purchased directly from the booth at that time? Thanks! Usually the underground entrance is used for groups but the Louvre is known for changing things up. The advantage of buying at the tabac is that you can have flexibility in your schedule in case of a worker strike (which happened a few years ago) or a flood (which happened last year). This is a great tip but I have two more questions that I hope you can answer. 1) Are the tickets you buy at the tabac date specific as the online tickets one purchases for the Louvre at a 2€ supplement are date and time specific. 2) In the past there was a supplement for the temporary exhibitions in the Hall Napoleon. These tickets in the past were also date and time specific, how does it work now? 1.) No, that is the beauty of buying at the tabac! You can be flexible in your schedule which I love and last I checked, the tickets were the same price as if you bought them at the ticket counter at the Louvre. 2.) I believe that is the same now. I suggest you buy your entrance tickets to the Louvre via the Tabac (I don’t think they carry temporary exhibit tickets) and then see if you can buy the temporary exhibit tickets through the self serve ticket kiosks. The line for the self serve kiosk is usually shorter than the line for the ticket window. I haven’t actually done that myself but that is my suggestion. Do you have to use the Louvre tickets purchased at the Tabac the same day or can use another day? I think they can be used any day but I am not sure since I have always bought them the same day I used them. Just wondering please what time the Tabac opens. I am heading to Paris at the end of this year and the main reason for going is to go to the Louvre. I’d like to head there as soon as it opens to purchase the ticket. The tabac is called La CIVETTE DU CARROUSEL and according to their website, they are open 10am-8pm. Thank you so much for your information! I bought the tickets in advance to avoid line today. You are welcome Michelle! I hope you enjoyed your visit to the Louvre. Great tip! Saved me and my gf about 45min of waiting in the cold (we peeked at the line before googling this tip). Zero wait at the underground entrance. Note, there wasn’t a red awning anymore but a silver overhang marking 99 Carrousel du Louvre which made it confusing to spot. Thanks for the update about the red awning now being silver! I am so glad you didn’t have to wait out in the cold. Merci!! Saved me hours when I showed up this week without having bought a ticket online. Went there on a Tuesday (Louvre closed on Tuesdays too) hoping that the shop will be open, but to my bad luck, it was not. So, going to try my luck tomorrow. Yep, it was a whole lot easier getting tickets from the tabac. Very easy. This was such a good tip! For some reason when we went we could not buy tickets ahead of time online because the “United States” was not listed as a “country” option when trying to put in credit card info on the Louvre’s site. Therefore, we thought we’d show up 30 minutes before it opened on a Wednesday morning and be OK. We were wrong! The line for general admission was crazy (probably at least an hour long). We used this tip and grabbed the tickets from the Tobac, and got inside in probably 10 minutes. This was as recently as early May, 2016. Thank you! Thank you Tyler for letting me know this worked for you. I love hearing back that my tips are useful! WOW! Thanks for verifying this tip. If it’s really true…. I can trust this for my visit to Paris in 5 days? Leaving today and having the same problem with purchasing online. US not even listed as an option. Fingers crossed this trick works. Thanks! Let me know Brad how it goes and bon voyage! Pick “Etats Unis” under country option for the US. Can youth (18-25) also get their free tickets there or do they have to wait in line at the Louvre? Good question. I don’t know the answer to that. I will see if I can find out. If I am not able to get an answer for you before you go, it might be worth purchasing a ticket regardless just to avoid the wait. If you decide to wait in the “without ticket” security line, be sure to use the self kiosks to buy your tickets once through security, it usually has a shorter line. Thanks Stefani. I am glad you find the information helpful. To answer your question, if you are a resident of the EU, Iceland, Norway, and Liechtenstein, you can enter through the “avec billet” line at IM PEI pyramid and simply show your ID to confirm age and residency. I asked around about your question and this is the answer I was told. If you are a resident of the EU, Iceland, Norway, and Liechtenstein, you can enter through the “avec billet” line at IM PEI pyramid and simply show your ID to confirm age and residency. This is great! Thank you. Will be trying it this coming June. Great Ana! June will be busy but buying your tickets at the tabac will help. Enjoy your visit! Yes, to my knowledge it is still selling the Louvre entrance tickets. Have fun in April! It is called La Civette du carrousel. Amazing tip! My husband and I did this today and probably saved us over an hour in total! the Tabac shop is still exactly where you described…also another tip is to make sure you have Euros on you! FYI they only take cash for the museum passes! We also bought passes for the D’Orsay and will go there tomorrow! You don’t have to use all the day passes on the same day.. but they’re only good for the day you enter! This was the best tip of our trip! Thank you so much! Hope this helped. Excellent tip.Thanks a ton!However a quick question,is the Tabac shop at the Carrousel as you mentioned still selling the tickets? As far as I know it is still selling them. Did you stop by and find out differently?! Quelle horreur if they have stopped. Bises to you for these great tips and the detailed information about getting tickets at the tabac. I was one of those that waited in line for tickets, but it really wasn’t too bad on the cold December day we visited. De rien Cathy! I’m glad your wait wasn’t too bad especially being in cold weather. I hope you are able to visit again and try out the tabac. This is where we used to buy tickets when we lived in Paris…such a great tip! Thanks for linking up to #AllAboutFrance, hope to see you back again next month…2nd July (first Thursday of each month). Great tips! You’re totally right! I personally skipped the whole process by just going on a free museum Sunday, but entering through the underground saved me about 2 hours from the line up above! Fun post on #AllAboutFrance! Thanks. I’ve never gone on free Sunday – I’m sure it is a mad house. Merci beaucoup! I’ll be heading there this summer but didn’t really think I’d be getting the Paris Pass this time so this is an excellent alternative. De rien Stacey! Let me know how it works out for you. Bon voyage!